"Did somebody say... real power?" "Whoever does not miss the Soviet Union has no heart. Whoever wants to restore it back as it was has no brain." At the end of the 1990s, Vladimir Vladimirovich Putin (Влади́мир Влади́мирович Пу́тин, born 7 October 1952) was just another former KGB man attempting to make his way in The New Russia. Then he was selected to become Prime Minister. Whether you love him or hate him, Putin is the man who returned Russia to great power status after the disasters of the 1990s. Sometimes the President, sometimes the Prime Minister of Russia, but always the real power behind the state. Used to be a KGB boss in East Germany, then worked for the FSB, the successor organization to the KGB. Once possibly single-handedly saved a group of people from a wild tiger. Will not stand for rogue states seeking to possess nuclear vessels (unless they're Iran). Bad Vlad, as he is known, has also gained significant Memetic Badass stature on the intrawebs, due to carefully perpetuating the image of a tough as nails manliness incarnate known for his personal attention to pressing problems, practicing extreme sports and other forms of peril-fraught recreation and having a fondness for snow leopards of all things. The stories of his KGB days, his expertise in Judo and other martial arts, and the fact that he looks like Daniel Craig help this. This is slightly undermined by the fact that he also looks like Dobby. 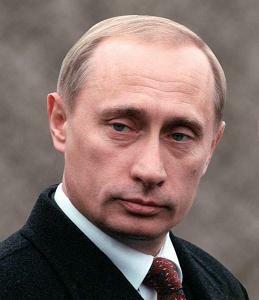 Vladimir Putin is very popular in Russia, with around half of the people supporting him and his party, United Russia. The main reasons people support him besides his Memetic Badass image include his successful efforts to increase Russian influence on the world stage. During the first years of his tenure, the Russian economy has indeed strengthened (although in no small part due to high oil prices) and the power of the oligarchs - or at least, those not in bed with the state - declined. However, his opponents claim he owes his high approval ratings to heavy-handed propaganda campaigns, preventing legitimate political competition through ruthless persecution of opponents (like Navalny, Khodorkovsky and Nemtsov), many cases of election fraud, at least some of which have been proven with near certainty, and, in the 2008-2014 period, cultivating dangerously nationalist sentiments for the purposes of gaining support for his tactics of meddling in the affairs of Russia's neighbors. Some more people claim that his popularity is artificially inflated by a political machine that makes Boss Tweed green with envy, and they may be right after all, judging by the vehemence of 2011 protest demonstrations. Chief accusations against his rule involve: lack of investment into industrial and scientific development, instead propping up Russia's economy with oil and gas exports, which proved extremely problematic for the country once oil prices began to stagnate; High amounts of corruption which explain why profits from said exports didn't make Russia enjoy a Saudi Arabia level of advancement; Major embezzlement on just about any state-funded initiative; The undermining and takeover of major independent businesses, with owners frequently jailed under flimsy pretenses. Censorship and increasingly strict control of television, press, and the Russian Internet on "moral grounds"; The Russian army's misadventures in Chechnya, Georgia, Ukraine and now Syria; and last but not the least, the fiercely investigated claims of Russia ostensibly playing a part in hacking the CIA and influencing propaganda in the 2016/17 Trump/Clinton elections. As of February 2019, 26 Russian nationalist and 3 Russian companies have been indicted by the US government for their involvement in the latter (though its highly unlikely they will ever see the inside of a US courtroom). As a result, Putin is criticized abroad for his aggressive foreign policy and increasingly autocratic rule. But Putin isn't letting the criticisms get him down. Protests or no, Putin has been the unquestionable ruler of Russia (despite sometimes letting his "successor" play President) since 1999. This person, Dmitry "I-will-transmit-this-information-to-Vladimir" Medvedev, officially took over as head of state in 2008. His reign didn't last long: Putin ran for President again in 2012, swapping places with Medvedev, and won. While the regime does the best in its power to ensure there are no serious challengers to Putin's candidacy, as of late, the Russian people had their largest protests of all time (since the fall of the Soviet Union) and the slogan "Russia without Putin" became a rallying cry - though the protests abated rather quickly after the opposition (as usual) devolved into the internal squabbles, throwing its own dirty underwear around, and making 'Bad Vlad' look like the sole reliable leader around. Again. Western scholars and journalists (e.g., Slate, Foreign Policy) have increasingly begun describing Putin as a "petty tyrant" and cast his actual power into doubt, but foreign policy experts also failed to predict the end of the USSR, so for the time being, it's anyone's guess whether or not his presumably grand plans will come to fruition. With the undeniable clusterfucks note there really is no other word for the mess... that are going down in Ukraine and Syria blooming into diplomatic and not-so-diplomatic oppression onto Russia due to its actions in said clusterfucks, the support for Putin has dramatically increased, which was cemented on the 2016 elections with his pocket party United Russia taking the overwhelming majority in the federal parliament and many local parliaments. Putin strengthened the Shanghai Cooperation Organisation, an international organization that does - or did - nothing and was created as a symbol of cooperation with China. He also succeeded in making the Russian-led Eurasian Union with Belarus and Kazakhstan an actual entity, at least on paper. Both China and Russia are permanent members of the United Nations Security Council and The New '10s have seen the emergence of China and Russia forming a tacit alliance within the UNSC. No, not that one. While Putinisms (sayings by Putin) are not all that common, at least two became quite famous in-country. "Она утонула" (It sunk), he said, when he was asked about fate of Kursk submarine. Captain Obvious went green with envy. "Мы в сортире их замочим" (argo, literally: we will beat them to death in WC room; roughly translated: [should we find them taking a dump,] we will waste them in the shithouse), he said in context of dealing with international terrorism. In a pretty even voice. He was ranked as the world's most powerful man in 2013 according to Forbes. Hes also likely one of the richest people on the planet but the exact worth of his asserts is a bit hard to calculate . Also in the same year, he's granted ninth-degree black belt in Taekwondo, by World Taekwondo Federation — which means he exceeds Chuck Norris (eighth-degree) in badassery.